STAIN PREVENT ELIMINATES MINERALS Quality controlled formula. A mixture of water conditioners which makes pools minerals and metals inactive.Contains chelation agent. Liquid concentrate.pH 0.75. Prevents corrosion of the pool equipment. Eliminates and prevents tartar build up on the inner surfaces of the pool without affecting the pH of water. CLARIFIER ALUM makes pool water sparkling clear. CLARIFIER ALUM is especially effective for pool water that is very cloudy or coloured by the presence of metal. For perpetually sparkling clear pool water, use Klear Sok or Action Cube. 2. Stop the filtration system and put the filter in recirculate (or whirlpool) position. Start the system. 3. 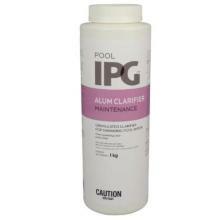 Add 400 g of CLARIFIER ALUM per 10,000 L of pool water. Sprinkle the required quantity directly on the surface of water. 4. Recirculate pool water for 4 to 6 hours. Stop filter and allow water to remain undisturbed preferably overnight to allow debris to deposit to bottom of pool. 5. Remove residue by putting filtration system in drain (or waste) position and vacuuming. 6. Readjust water parameters. Use pH+ to increase water pH, since using CLARIFIER ALUM decreases pH. Use approximately 200 g of pH+ per 500 g of CLARIFIER ALUM to reach pH levels of 7.2 to 7.8. When added phosphates are reduced to very low levels. Provides clear and sparkling water. POOL SPARKLE enhances the effectiveness of the filtering system by coagulating microscopic particles to larger masses. The solids thus formed are deposited at the bottom of the pool or are captured by the filtration system. POOL SPARKLE is not affected by chlorine, does not contain alum and is efficient in any pH condition without modification. POOL SPARKLE is used while the filtration system is working. 1. 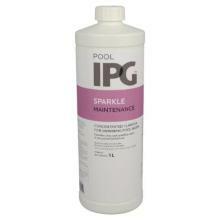 Initial treatment: add 50 mL of POOL SPARKLE per 10,000 L of pool water. Pour around the pool. 2. After 8 hours of filtration, if the maximum recommended pressure has been reached, clean the filter medium by backwashing the filtration system. 3. If needed, clean the bottom of the pool. 4. Adding 50 mL of POOL SPARKLE per 10,000 L of pool water on a weekly basis will help keep pool water clear and sparkling. 5. For very cloudy water due to high hardness levels, airborne dust or dead algae: pour 250 mL of POOL SPARKLE per 10,000 L of pool water. FLOCCULATING AGENT for cloudy Swimming Pool Water. SPARKAL DROP is an inorganic polymer that readily forms soluble or insoluble complexes with anionic materials present in water. This polymer facilitates the floculation of floating debris, dead algae and minerals that cause cloudy, brown or green water. These debris are then easily vacuumed. SPARKAL DROP does not affect pH, chlorine or any other type of sanitizer. NOTE: Application of this treatment in rainy weather is not recommended. Using SPARKAL DROP with a diatomaceous earth filter is not recommended. 1. Fill the pool above the skimmer. 3. Add 80 mL of SPARKAL DROP per 10,000 L of pool water. Pour the required quantity evenly over the entire surface. 4. Recirculate pool water for 4 to 6 hours in order to disperse the product. Stop filter and allow water to remain undisturbed preferably overnight to allow debris to deposit to the bottom of the pool. 6. Don't forget to clean the filter before returning to regular operation by first performing a backwash. Use our CLEAN filter cleaner for any kind of traditional filter. When you start your pool, at springtime or during the regular season, shock treatments are required and a waiting period is necessary until the residual value has dropped to the recommended levels of 1 to 3 ppm. If you wish to decrease the sanitizer residual rapidly, use TERMINATOR and take advantage of your pool immediately. TERMINATOR will not affect the colouring of vinyl, cement or fibreglass pools. 1. Test the sanitizer level. If readings are higher than 3 ppm, add TERMINATOR in small quantities (50 ml per 10,000 L of pool water) to reduce high sanitizer level back to acceptable levels 1-3 ppm. 2. Wait for 1 hour. 3. After adding TERMINATOR, check water's pH and adjust to 7.2-7.8 if necessary. A granular sequestrant that helps remove quickly water discoloration in swimming pools from the presence of metals such as manganese, iron and copper. 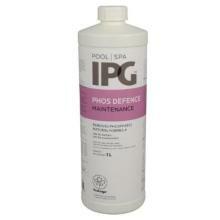 Can also be used to remove staining on every type of swimming pool surface due to metal. 1. Adjust pH between 6.8 - 7.2 and let the chlorine level drop below 2 ppm. 2. For pool water discoloration, pour 150 g of METABAN per 10,000 L of pool water directly over the swimming pool surface. For stain removal, proceed to # 3. 4. Add 150 g of MET ABAN per 10,000 L of pool water to a pail of water and apply the concentrated solution along the pool walls and/or in areas where staining is present. Where stains are most prevalent directly brush with the product. 5. Severe staining of surfaces may require up to 300 g of METABAN per 10,000 L of pool water. 6. Allow the circulation system to run continuously for 24 hours. 7. After 24 hours, adjust pH between 7.2 - 7.8 and alkalinity between 80 - 120 ppm. 8. Do not superchlorinate water for at least 72 hours. 9. Continue to use METABAN on a weekly basis to prevent the reoccurrence of staining of swimming pool surfaces or water discoloration. SKIN SILK softens water and improves bather comfort. It is a selected pool product combined with aromatherapy so as to enhance water quality. 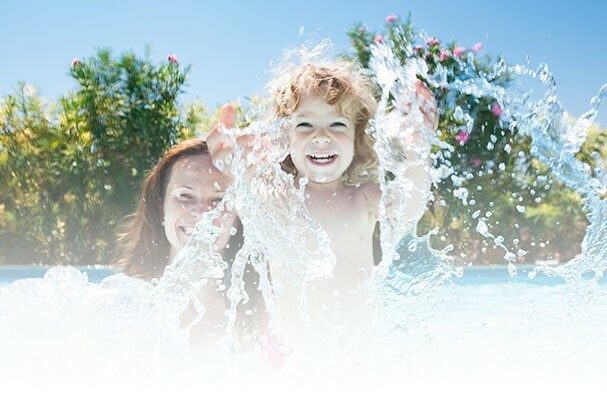 SKIN SILK is compatible with pool sanitizing chemicals and increases their efficiency. Balanced pH formula that won't affect pool water parameters. 1. For initial treatment in early season add 1. 5 kg of SKIN SILK per 10,000 L of pool water. Add the required quantity in 2 applications at 4-hour intervals. (mid-July), add 1.5 kg of SKIN SILK per 10,000 L of pool water. Add the required quantity in 2 applications at 4-hour intervals. 4. Check water pH after application and adjust between 7.2 and 7.8 if necessary.